For hearing impaired or heavy sleepers! Combines visual alerts and icons, audio tones and melodies, as well as a bed shaker to conveniently notify you of incoming phone TDD rings, doorbell and alarm clock alerts. Use all of the alert functions or customize to your preference. Easy to set up for wireless notifications. 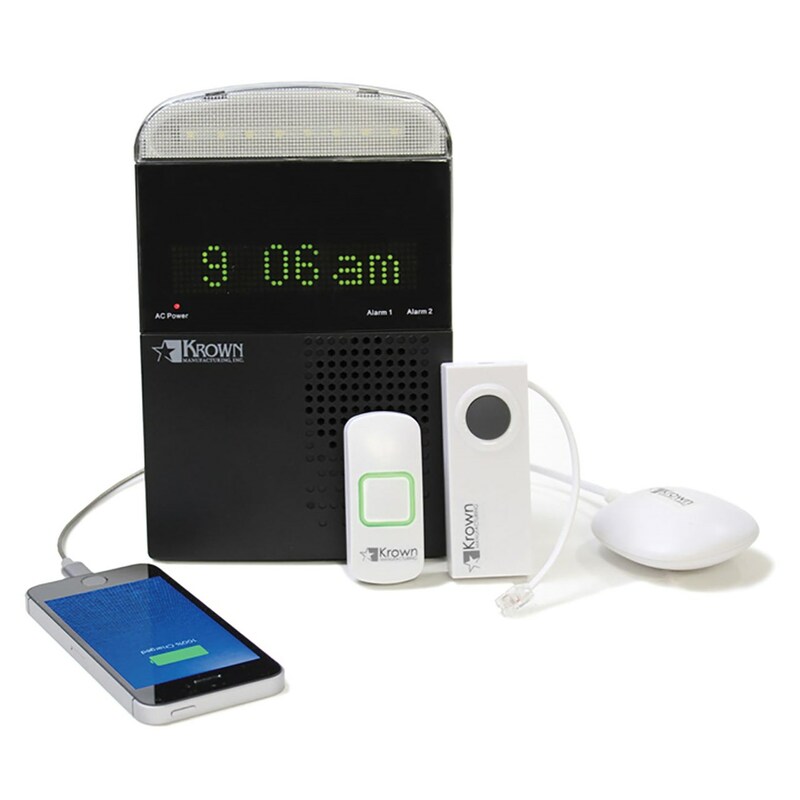 5 different alerts: built-in LED lights, loud audible alarm, strong bed-shaker, flashing words across the large display, and picture icons that light up when activated. Phone/VP transmitter lets you know when you have an incoming landline phone or videophone call. When paired with the receiver, you will be alerted by bright LED flashing lights, picture icons, loud audible alarm and a powerful bed shaker that you have an incoming call. Simply connect the phone and wireless transmitter then insert the splitter into the line jack. Transmitter has a range of up to 1000 feet from the receiver. Doorbell transmitter is easy-to-install, with no wiring required. Simply press the doorbell button, and the wireless transmitter will send a radio signal to your receiver. Transmitter has a range of up to 1000 feet from the receiver. Includes mounting kit: screws, mounting bracket, and adhesive strip. Bed shaker will wake up even the heaviest sleepers. Simply connect to the All-in-One LookOut receiver and place the bed shaker under a pillow.